(From right) Simon Featherstone, the UK's project director for the Expo, Huang Jianzhi, deputy director of the Bureau of Shanghai World Expo Coordination, Chris Wood, deputy head of the British Embassy in China, Da Honghu, board chairman of Suzhong Construction Group Co Ltd, and Lu Haiqing, corporate relations director of Diageo (China), plant a Ginkgo tree during the ceremony marking the start of construction for the British Pavilion on March 12, also Chinese Arbor Day. Britain started construction of its pavilion for 2010 Shanghai World Expo on Thursday. The pavilion covers an area of 6,000 square meters. 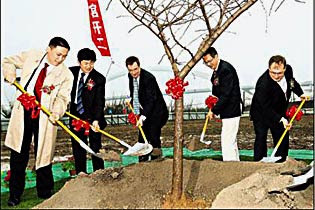 Two Ginkgo trees were planted at the ground-breaking ceremony on March 12. The construction will be completed in May 2010.